At the annual SETsquared Garden Party and Innovation Showcase in Bristol yesterday, the pioneering technologies showcased included converting waste water to protein, creating algae farms for the £5bn fish and animal feed markets, and a glowing, spherical musical. Some of the South West’s most innovative technology companies from the SETsquared Business Acceleration Centres at the Universities of Bath, Bristol and Exeter presented their businesses to large corporate companies, prospective investors and grant-funders at the event in Goldney Hall, which attracted more delegates than in the previous seven years. In a time of economic uncertainty, the SETsquared Centre in Bristol was proud to announce the recent $1.6m investment in one of its ventures, enModus, who exhibited at the event in 2010. During the evening, eight selected companies entered a 60-second ‘Elevator Pitch’ competition to promote their businesses. The audience, of Venture Capitalists, SWAIN investors, representatives of the grant-funding and venture capital communities from London and the South West, senior executives from major corporates plus supporters and mentors of the SETsquared activity, voted for the best elevator pitch. 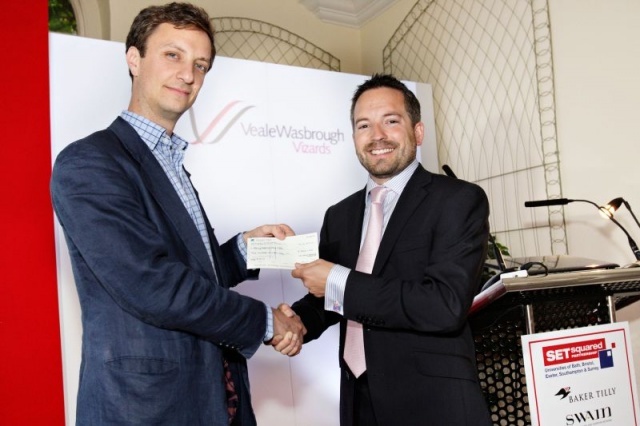 Aragreen (UK) Limited, based in Bath, won the most number of votes and secured the top prize of £500 and the Veale Wasbrough Vizards Elevator Pitch trophy. companies to network with potential investors and corporates. Nick Sturge, SETsquared Centre Director commented, “The key to success in any organisation is partnership: we are now working with corporates and investment groups to really accelerate the growth of companies we support. Three of Bristol SETsquared’s 52 current members are based at the renowned Pervasive Media Studio in Bristol and receive business support from the SETsquared Centre, demonstrating the value being created at the interface of creative industries and high-technology. The Garden Party 2011 event was sponsored by South West Angel and Investor Network (SWAIN), Veale Wasbrough Vizards, Baker Tilly & the South West Microelectronics iNet. The University of Bristol is committed to combining its excellence in research and innovation with a vibrant enterprise culture. The University is working with government, industry and other partner organisations to encourage the growth of knowledge-based businesses in the South West. In particular, Bristol has joined forces with the Universities of Bath, Southampton and Surrey to establish the SETsquared Partnership to encourage enterprise, build new businesses and work more effectively with industry. As research-intensive universities, these enterprise activities derive from their research base, although support is also available to entrepreneurs from outside the universities. With a combined research staff of 6,400 and research budget of £266 million, the resulting contribution to the UK knowledge economy is far greater than could be achieved individually. • Access to innovative research that could lead to new products and processes. including micro-electronics, environmental technology, bio-technology, creative technology and advanced engineering. This advice covers structuring and shareholders’ arrangements, funding, commercial and trading arrangements, employment, IP protection and exploitation and property. VWV offers discounted and fixed fees with a realistic time to pay, and some free legal templates. VWV has worked closely with SETsquared for many years and has provided a free weekly “Lawyer in Residence” service at SETsquared Bristol since 2009. The team also advises entrepreneurs and early stage companies supported by Bath Ventures and UWE Ventures. throughout the South West region incorporating the counties of Wiltshire, Gloucestershire, former-Avon, Somerset, Dorset, Devon and Cornwall. Baker Tilly is a leading mid-tier provider of accountancy and business services whose clients include growing entrepreneurial businesses, listed companies and high net-worth individuals. We operate in a number of sectors – from Professional Practices, Pensions and Property to Charities and Education, Agriculture, Media and IT – providing focused knowledge through a range of industry specific skills. Our particular expertise is in helping owner managed, entrepreneurial and growing businesses to achieve their ambitions. Baker Tilly is represented across the UK through its network of 28 offices including Bristol and Bath in the South West. The SW Microelectronics iNet provides advice and resources to support small to medium sized microelectronics companies across the South West and help turn business ideas into real products and services. By understanding what it takes to nurture innovation along with the challenges faced by our particular sector, we have created the kind of practical, well targeted support required to make a difference to your business. By connecting and extending our existing networks we create real opportunities for companies in the South West. Our £2.3m ERDF funded project forms part of the Government’s ‘Solutions for Business’ portfolio with all support and services offered free of charge. Led by The University of the West of England, we are backed by an impressive consortium of regional partners bringing a wealth of knowledge and expertise to the project. We provide an effective arena for innovation by providing networking activities, supporting new company and new product development, and assisting with transitional phases during company growth. The iNet also forms part of a longer term vision to strengthen our globally recognised Microelectronics sector in the South West. Aragreen (UK) Ltd, based in Gloucestershire, is a hi-tech manufacturing company using waste water to manufacture algae products. In association with the University of Bath, who have committed £320,000 of investment into the project and Welsh Water, the Company is developing a process which removes excess nutrients from waste water by utilizing them as a key feedstock in the manufacture of algae. The algae will be sold to manufacturers of fish and animal feed compounds: these markets are worth over £5.0 billion a year. By utilizing a combination of cutting edge production technology and what would otherwise be wasted nutrients (mainly Phosphates and Nitrates) from waste water, the Company aims to redefine the value proposition of algae, as a sustainable and cost competitive source of protein, for commodity markets. Calvium provides online tools and services that enable designers and web developers to create cross-platform mobile apps. It was founded in November 2009 by a team of five from HewlettPackard Laboratories with over forty years collective experience developing easy-to-use tools used across the world to make location-aware mobile applications. Mobile apps are about to experience an upsurge as brands start to use them to extend their digital presence, just as they once moved onto the web. They are targeting the digital media agencies who provide the web presence for brands. Agencies see a great opportunity to add mobile apps into their product mix but have a big problem. They do not have the technical skills currently required to develop mobile apps in-house and cannot afford to outsource development. Calvium solves their problem by enabling the designers and web developers at the core of agencies to design, build, publish and track mobile apps themselves. There are around 75,000 agencies worldwide. Initial market research indicates that a high proportion will adopt mobile app development. Assuming an ARPU of £3k and the usual proportion of early adopters and early majority, we expect a TAM over£100m to emerge by 2014. We believe that Calvium’s distinctive focus on designers will enable us to capture a significant fraction of that market. DocCom is a cloud-based Enterprise Social Networking platform for the healthcare niche market creating a paradigm shift in how healthcare professionals and healthcare organisations communicate. The platform provides a base for user and organisational apps that tackle specific healthcare business problems and have a major impact on cost, productivity, safety and quality. DocCom is backed by Eden Ventures and is considered one of the UK’s top emerging health tech companies. Their ambition is to be the largest multi-professional healthcare networking platform on the planet and are releasing our 2nd generation platform this summer following migration to Microsoft Azure to take on the global multi-billion dollar market in healthcare. dpcloud is a web application (SaaS) that makes creating and publishing live video presentations with synchronised Powerpoint, photo-albums, web pages, Twitter and other media, very easy. Just sign up for an account, plug-in your webcam, add your media and record. Their target is to scale to 2500 clients in the next twelve months and turn over £1m by launching our new dpcloud facebook application, apps.facebook.com/dpcloud. This is sold through the facebook web app store and our standalone Pro product through other web app stores like Azure. Our goal is to launch dpcloud for LinkedIn within the next six months and sell through the LinkedIn app store. Linux systems against local and remote network-based attacks and provide bespoke security software systems. In just over a year they have established a profitable business with customers including major semiconductor companies, set-top-box manufacturers, leaders in digital content security and well known global producers of consumer audio-visual equipment. Now the company is defining new products for driving the future growth of the company aiming at the 100s of millions of digital TV products coming to the market with the ability to connect to the internet. Members of idAngels (http://idangels.net) protect one another from identity fraud by storing photos of themselves, together with name and address, on the secure site. These reference media are cross-verified by those nominated members they know personally, creating a network of identity referees and media with the sole purpose of ensuring that “Nobody else can be you”. idAngels is modelled as a social enterprise, free to join, run for the benefit of its members. realidcheck (“reality check”) delivers the power of idAngels as a set of web services with which organizations can detect identity fraud at the point of customer encounter. Relying parties pay a per-encounter fee to use the service (http://realidcheck.com). AlphaSphere, from nu desine, is a new musical instrument, which brings our customers, away from the computer, and back to an instrument. Modern musicians have reluctantly become increasingly dependent on computers in order to produce and perform high quality modern music. AlphaSphere is the solution to this. They are currently running a soft-launch which is allowing our Alpha and Beta testers to get their hands on the product as our first customers. Viral Ad Network, part of the Team Rubber group of businesses, is a specialist platform to share fun, and entertaining online viral advertising for agencies (advertising, PR, media) and brands. VAN helps brands maximise the exposure of viral content (videos and games), and reach their desired target audience, with a highly transparent and simple pay-per-click model. The network uses sophisticated proprietary technology developed in-house, backed by a customer service ethos that makes VAN simple for clients to understand and buy. Working with brands including Cadbury, BBC, Selfridges, Range Rover, La Senza, American Express, British Red Cross, and a growing roster of agencies including JWT, Fallon, Dare and Hill & Knowlton, 2010-11 turnover was £267k, with over £1m expected in 2011-12.
attoCAD has created LayoutMaker, a tool that enables semiconductor companies to reduce costs and dramatically improve time to market for analog chips. A typical analog chip project takes 18 months to complete. Laying-out of the chip design is a major bottleneck, taking 28 man-months. LayoutMaker can save up to 22 of those man-month and, crucially, reduce the typical project length from 18 to just 11 months – giving the customer a significant competitive advantage and improving their profitability: direct savings are estimated at £210-420k per annum per design centre; savings from shorter time-to-market are difficult to estimate and vary by project, but are anticipated to be in the multi £100k’s or £1m’s. Challenge for Change is an innovative social marketing agency that specialises in designing and implementing effective behavioural change programmes that get more people cycling, walking and using sustainable modes of travel. It has implemented a number of programmes across the UK, Australia and New Zealand. After 4 years of operation more than 60,000 people have participated in Challenge for Change’s programmes – with more than 10 million miles cycled and 1 million kilograms of CO2 saved by participants. The company was entirely organically grown and has grown from three staff two years ago to a bright and switched on team of ten full time staff. Challenge for Change is a company with high growth potential. There are large opportunities in Europe and North America for its products and services which are currently being pursued. Challenge for Change has recently appointed Phillip Darnton OBE to the Board as Chairman and they are actively looking for another 1 or 2 Non-executive Directors to join the Board. Clocksushi® is a Diary Systems Ltd product. Diary Systems is a technology company based in Bristol, UK and was set up in 2007 to provide low cost solutions to independent personal trainers and other freelance and micro businesses. 24 million people bought or booked something online in the last 3 months, but almost none of them booked a Personal Training session or group exercise class. This represents a huge gap in a market with an already established and growing behavioural trend. Clocksushi® is the easiest to set up online booking system, working on a low cost, Software as a Service (SaaS) subscription model. Trainers can quickly set up a profile web page and be ready to take bookings from their clients in less than an hour. If clients book online they don’t need to phone, which means trainers get to spend more quality time with the clients their working with, have less interruptions and have more time to earn. Fantasy Shopper is a new and unique shopping experience fully integrated with Facebook and Mobile which recreates the real world shopping experience online. Fantasy Shopper is entering the market as a social game to achieve fast viral growth targeting a rapidly expanding market that already consists of 450million users worldwide. Fantasy Shopper evolves social gaming by making it more relevant with the incorporation of real world data. Their goal is to have 30 million users by the end of 2012 and achieve in excess of £50m revenue per year. We have many exciting partnership opportunities and already have investor interest based on a £40m valuation at this early stage. Fantasy Shopper is looking to raise around £2m to grow the technical and business development teams. TopicLogic was founded in 2010 to provide a new web service to allow users to organize all their files wherever they are stored. For professionals facing increasing information fragmentation and overload, TopicLogic breaks the ‘organize by folder’ paradigm by allowing them to manage their resources by subjects which are relevant to them. This enables faster file access and simpler sharing. The product will be sold and supported as a web service for both the general and the vertical applications. It will be priced using a freemium model, which will be aligned to services such as Evernote, Box and Dropbox. For premium subscribers the price will be £10 per month. Costs will be kept very low – the service will only be storing metadata and third party costs will be minimal. Trust Mico is an online business directory, with mobile applications, that allows people to search for, find and recommend businesses that they like and then share those recommendations with their friends and colleagues. It is a platform to put your word of mouth online. Review sites are severely flawed. They are subject to fraud (positive and negative), are anonymous and cannot be trusted. Critically, they do not help businesses and have, in fact, severely damaged many. Trust Mico is a positive experience and provides huge benefits both for users and businesses. Through the website, businesses can offer targeted incentives, reward people for referrals and run their own loyalty scheme. They can also connect with other businesses to form “shop local” community loyalty schemes that don’t need till systems or plastic cards. Verifying hardware and testing software to ensure correctness continues to increase in both complexity and cost. Yet the impact of poorly performed verification is very high: expensive mask sets; delays to market; costly recalls; damage to brand; etc. Verification is a specialist skill with a lumpy resourcing profile – do you really want your best engineers to spend their time testing? Or do build up in-house excellence? Developing an effective, efficient in-house software testing/hardware verification capability is time consuming, expensive and subject to numerous changes without guaranteeing addedvalue to the organization. It is therefore an ideal target for outsourcing. XCD HR is one of only a few cloud based HR software solutions in the UK who are ideally positioned to take advantage of this market disruption. They have been selected to take part in the April 2012 pilot and are working with a select number of companies, accountancy practices and payroll bureaus. XCD will simplify payroll administration for both employers and payroll bureaus as well as providing BACS payment and HMRC RTI submissions. Real Time Information (RTI) is a key Government priority aimed at improving the operation of PAYE by making the system better for customers and easier and more efficient for employers and HMRC to administer. The ultimate goal is to have all payroll submissions processed via BACS with a dual report sent to HMRC via the Government Gateway, thereby avoiding the requirement for end of year PAYE processing. This initiative places significant costs and complexities on existing payroll software vendors and payroll bureaus who will have to bear the cost of this transition.